"And dreams are the language of God. When he speaks in our language, I [Gypsy] can interpret what he has said. But if he speaks in the language of the soul, it is only you who can understand." "What's the World's Greatest Lie? It's this: that at a certain point in our lives, we lose control of what's happening to us, and our lives become controlled by fate. That's the world's greatest lie." "When I had my sheep, I was happy, and I made those around me happy. People saw me coming and welcomed me, he thought. But now I'm sad and alone. I'm going to become bitter and distrustful of people because one person betrayed me. I'm going to hate those who have found their treasure because I never found mine. And I'm going to hold on to what little I have, because I'm too insignificant to conquer the world." "If good thing are coming, they will be a pleasant surprise," said the seer. 'If bad things are, and you know in advance, you will suffer greatly before they even occur.'" "The fear of suffering is worse than the suffering itself." "It's not what enters men's mouths that's evil." 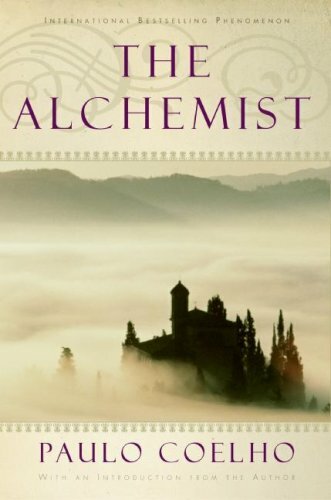 said the alchemist. "It's what comes out of their mouths that is." "But before I go, I want to tell you a little story." "A certain shopkeeper sent his son to learn about the secret of happiness from the wisest man in the world. The lad wandered through the desert for forty days, and finally came upon a beautiful castle, high atop a mountain. It was there that the wise man lived." "Rather than finding a saintly man, though, our hero, on entering the main room of the castle, saw a hive of activity: tradesman came and went, people were conversing in the corners, a small orchestra was playing soft music, and there was a table covered with platters of the most delicious food in that part of the world. The wise man conversed with everyone, and the boy had to wait for two hours before it was his turn to be given the man's attention." "The wise man listened attentively to the boy's explanation of why he had come, but told him that he didn't have time just then to explain the secret of happiness. He suggested that the boy look around the palace and return in two hours." "The boy began climbing and descending the many stairways of the palace, keeping his eyes fixed on the spoon. After two hours, he returned to the room where the wise man was." "The boy was embarrassed, and confessed that he had observed nothing. His only concern had been not to spill the oil that the wise man had entrusted to him." "Relieved, the boy picked up the spoon and returned to his exploration of the palace, this time observing all of the works of art on the ceilings and the walls. He saw the gardens, the mountains all around him, the beauty of the flowers, and the taste with which everything had been selected. Upon returning to the wise man, he related in detail everything he had seen." "'But where are the drops of oil I entrusted to you?' asked the wise man." "Looking down at the spoon he held, the boy saw that the oil was gone." "'Well, there is only one piece of advice I can give you', said the wisest of wise men. 'The secret of happiness is to see all the marvels of the world, and never to forget the drops of oil on the spoon."